There have been two races so far this season, and two lap records have been set. Power ran a 1:00.2450 and claimed the lap record at St. Petersburg, and Castroneves put in a 19.0997 second lap at Phoenix, besting the previous record. 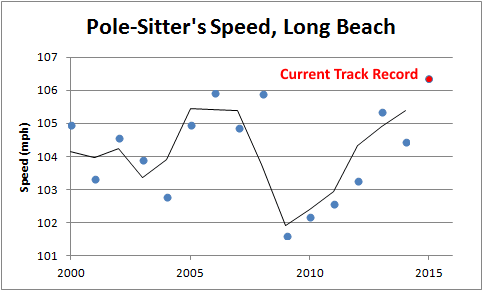 I wouldn’t be surprised to see another lap record fall this week at Long Beach. Here’s a look at the pole-sitter’s speed through the years — qualifying is usually where the track record is broken. Expect the new track record to be between 106.9-107.2 mph. As to who will set that record? My money’s on Castroneves or Power, two of the best qualifiers in the field. 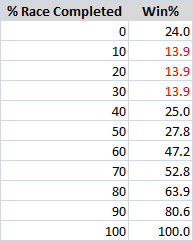 Below is the win expectancy for the driver in first place at different stages of the race. You’ll notice that the win expectancy actually drops off from the initial 24 percent during the 10-30 percent of the race completed stages. Why would the driver in first be less likely to win the race when 10 percent of the race is completed than when he started on pole (and thus had more of the race left to complete)? First, I think that the beginning of the race is pretty chaotic and a lot of overtaking happens, so it’s pretty easy for the guy who started on pole to get overtaken. And second (and more likely), if a driver started on pole and knows he has a competitive car, he may not be too worried about leading right away. He’ll let the aggressive guy in second place overtake him and then just focus on strategy, conserving fuel and tires, etc. Just preparing for the second half of the race where things start to matter more. If you have any more ideas on it let me know in the comments. It’s really just a top five list of the drivers who have the most race wins, so I don’t really get it. But anyway, they have a poll setup on their Facebook page where fans can pick who they think the best driver of all time is: as long as it’s Unser, Foyt, Dixon, Michael or Mario Andretti. You can go vote in that poll here.